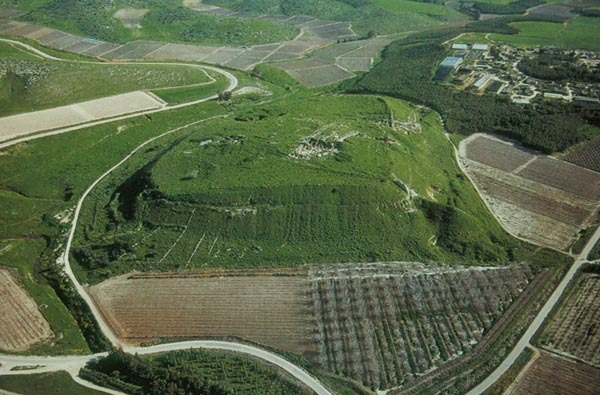 Next to Jerusalem, Lachish was perhaps the most important city of Judah. It guarded the south western portion of the Judah. In that later part of Judah's history, Lachish was sieged and destroyed on two occasions: in 701 B.C., by the Assyrians during the reign of Sennacherib, and in 588-87 B.C., by the Babylonians during the reign of Nebuchadnezzar. Artists rendition of ancient Lachish. 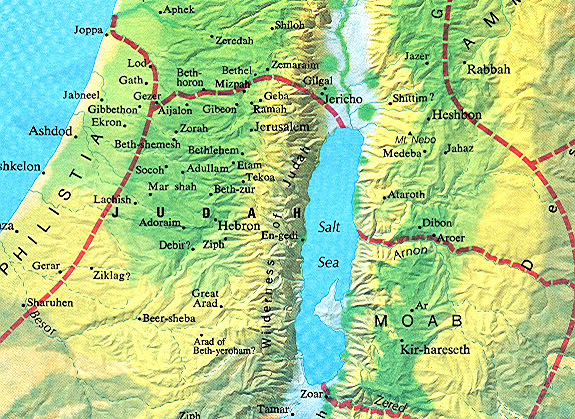 The city was surrounded by deep valleys except on the south-western side. Though it was heavily fortified, it was the main area of attack in both sieges. 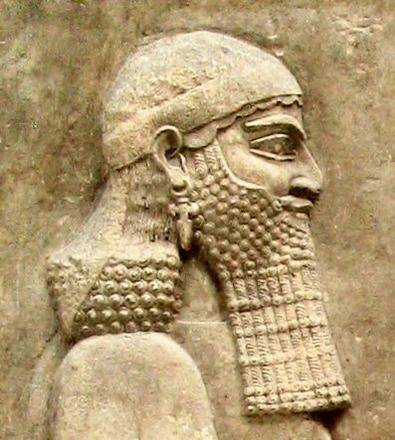 In 704 B. C., Sennacherib ascended the Assyrian throne. Shortly thereafter he lead a military campaign against Babylonia, where a revolt was taking place. In 701 B.C., he lead his troops into Syria and then into Judah. In that year he laid siege against Lachish, one of several cities of Judah that were in revolt during the reign of King Hezekiah. 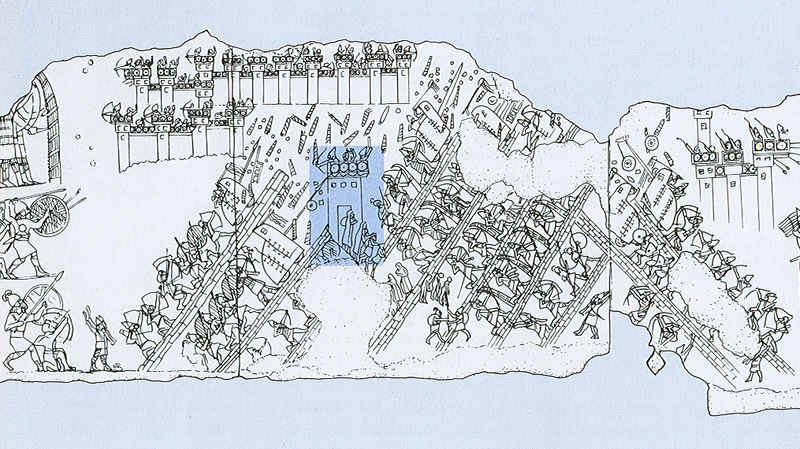 The siege of Lachish by the Assyrians is archaeologically well documented. Excavations at Tel Lachish have produced abundant evidence of the siege. 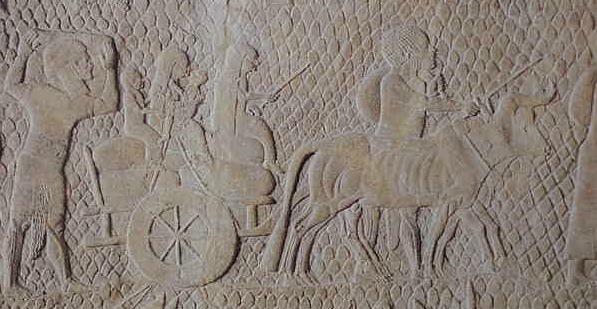 More importantly, in his palace at Nineveh, Sennacherib commissioned a set of stone reliefs be made commemorating the siege to decorate the walls of a room dedicated to the battle. 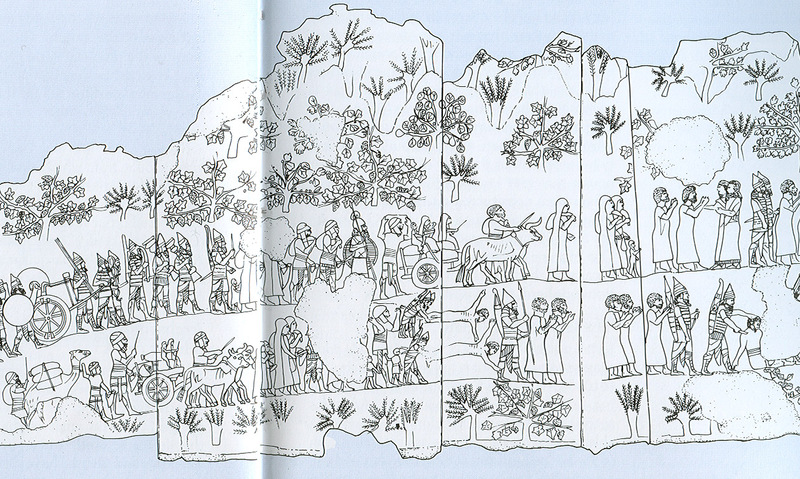 The reliefs depict the siege of Lachish. 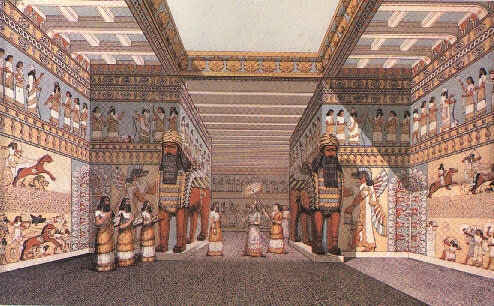 Depiction of Sennacherib's throne room at Nineveh. 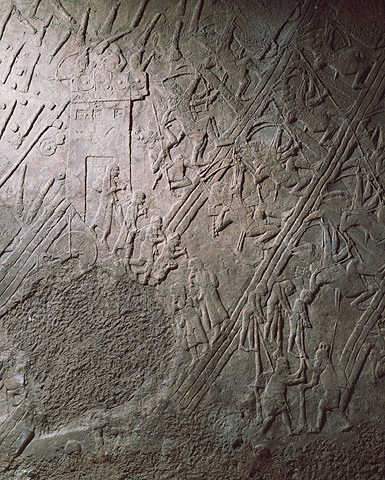 In this section of the relief, the siege of Lachish is portrayed. The city is seen in the background. 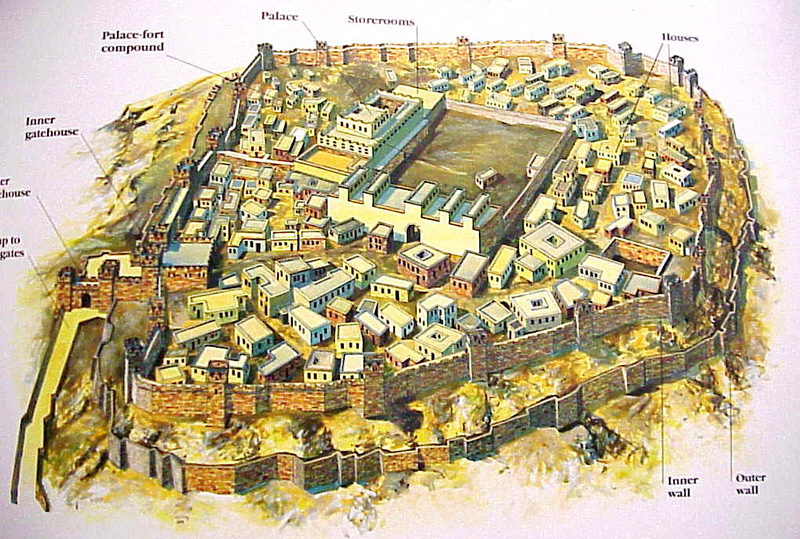 The Assyrian siege ramps and battling rams can be seen attacking the most vulnerable part of the city wall, the gate (seen in the highlighted blue area)! . The Jews on the wall above are throwing torches onto the siege ramps hoping to catch them on fire. The reliefs also depict the taking into captivity the defeated Jews. 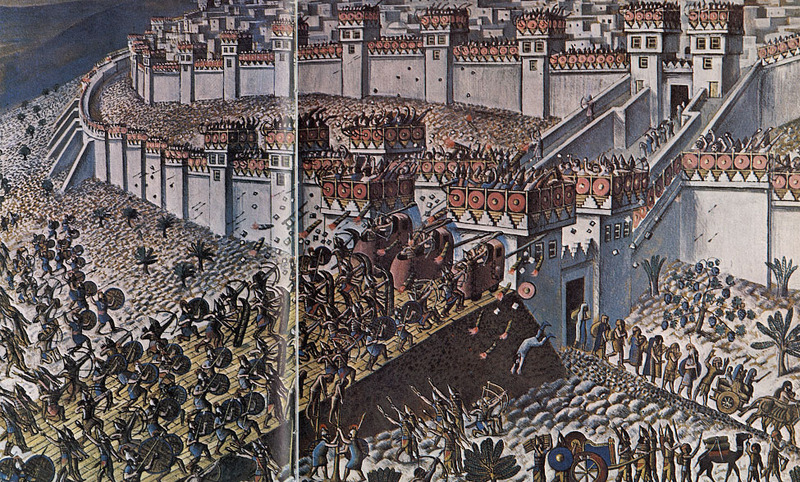 Though this is portrayed at the same time the battle is going on, reality is that this would have happened after the gate and walls would have been breached and the Jews defeated. Out of the gate Jewish captives are being taken to Assyria. They are being lead by other captives who are being empaled on poles. The upper portion of the panel reveals the horticulture of the area surrounding Lachish, (perhaps date palms, olive trees, or fig trees). 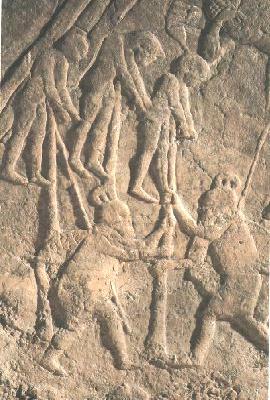 The left part of the middle portion of this panel shows the Assyrians hauling off the booty of their victory. On the right as well as on the lower portion of the panel, captives are being taken. Some are being killed while others will become slaves. 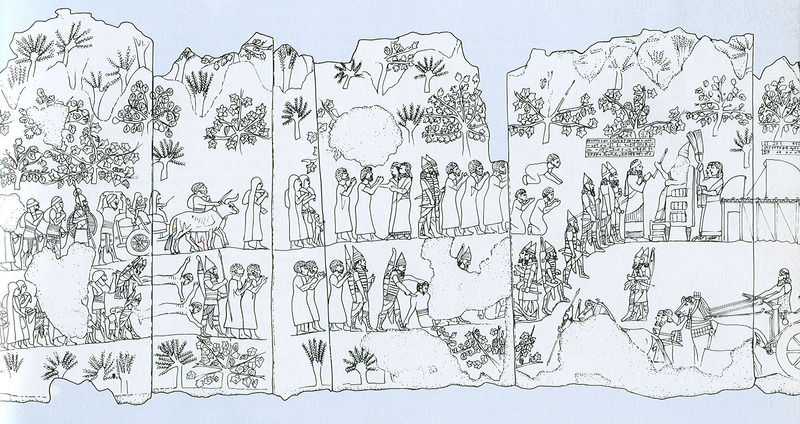 On the left end of this panel, Sennacherib is seen sitting on his throne directing the siege of Lachish.